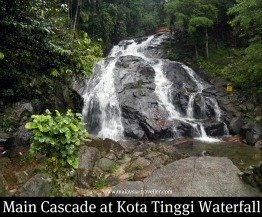 Kota Tinggi Waterfall is located 15km from Kota Tinggi town and around 60km from Johor Bahru. Its proximity to JB means that it can get crowded at weekends and school holidays and it is popular with Singaporeans who don't have many decent waterfalls at home. This popularity might explain the expensive admission charge compared to other waterfalls in Malaysia. I went there recently. The short drive from Kota Tinggi town took me through scenic countryside before I reached the entrance gate to Kota Tinggi Waterfall Resort. Here I had to pay RM 10 (per adult) for admission (RM 5 for kids) and RM 3 for the car (MyKad rate). After parking the car I walked towards the main waterfall past a restaurant, a shop and a Tube rental kiosk. It was a drizzly Monday morning (not in the school holidays) and there was hardly anyone there except for one coach load of Chinese tourists doing a quick photo stop. The tubes (RM 5 rental) are for the two water slides and for playing in the 'natural' pools which have been created by damming the stream. After admiring the main cascade I ventured over to the cement steps alongside the falls leading to the upper level. Here there were some shallow pools suitable for splashing around and relaxing. Nets had been slung across the stream at various points presumably as a safety measure to catch people who might be in danger of being washed over the edge of the falls during flash flood time. At this level I could see a second waterfall, more impressive than the first but there were barriers and signs up preventing visitors from swimming in the fall's plunge pool which, I guess, is dangerous. The location is marked on the map on my Top Johor Attractions page. Once you are near Kota Tinggi town there are plenty of signposts marked air terjun showing the way. The waterfalls are open daily during daylight hours. 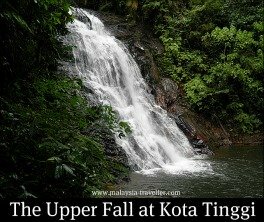 There is a hotel at the falls called the Kota Tinggi Waterfalls Resort. Its chalets looked in good condition from the outside. 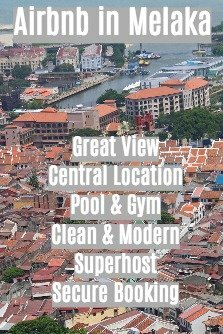 You can check for room rates and availability by clicking on the Agoda advert below. A great place for a nature escape but would I want to stay there? Maybe not - once you have seen the waterfalls and had a go on the slides there is little else to do but if you are in a large group you can take part in some of the hotel's adventure/teambuilding activities. I noticed some significant earth moving going on just opposite the resort. I hope they are building something which is compatible with the surroundings.